[188 Pages Report] The Top 10 High Growth Ceramics Market. It includes an analysis of the high growth ceramics, such as transparent ceramics, technical ceramics, 3D printing ceramics, electronics & electrical ceramics, ceramic textiles, ceramic matrix composites, ceramic coatings, ceramic inks, ceramic fibers, and bioceramics & piezoceramics. Both, top-down and bottom-up approaches have been used to estimate and validate the size of the global market and to estimate the sizes of various other dependent submarkets in the top 10 high growth ceramics market. The research study involved the extensive use of secondary sources, directories, and databases, such as Hoovers, Bloomberg, Chemical Weekly, Factiva, and other government and private websites to identify and collect information useful for the technical, market-oriented, and commercial study of the global top 10 high growth ceramics market. This research report provides analysis of transparent ceramics (by product type, material type, end-use industry, and region), technical ceramics (by product type, material type, end-use industry, and region), 3D printing ceramics (by product type, form type, end-use industry and region), electronics & electrical ceramics (by product type, material type, end-use industry, and region), ceramic textiles (by fiber type, form type, end-use industry, and region), ceramic matrix composites (by matrix type, application, and region), ceramic coatings (by product type, technology, application, and region), ceramic inks (by technology, application, and region), ceramic fibers (by product type, end product, end-use industry, and region), and bioceramics & piezoceramics (by material type, application, and region). Ceramics are inorganic and non-metallic materials composed of more than one element. They possess properties such as hardness, wear-resistance, brittleness, refractories, thermal insulation, electrical insulation, non-magnetic, oxidation resistance, thermal shock resistance, and chemical stability. 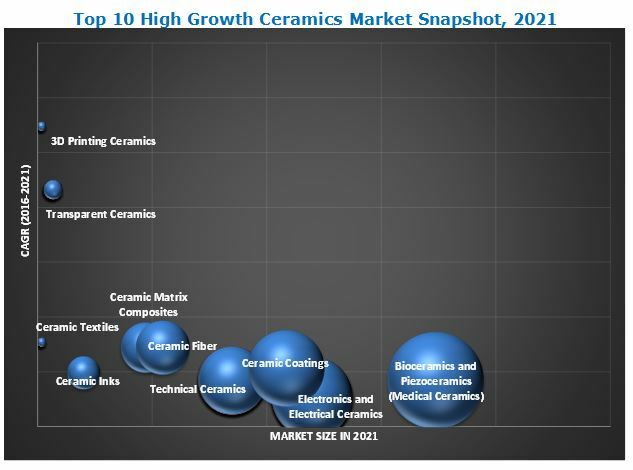 The top five attractive ceramics markets (in terms of highest market in value) out of the 10 covered in this report are bioceramics & piezoceramics, electronics ceramics & electrical ceramics, ceramic coatings, technical ceramics, and ceramic fibers. Bioceramics and piezoceramics are ceramics used to repair and reconstruct damaged human body parts. They are used in replacement of hard tissues of the body, such as hip joints and knee prostheses, and in replacement of oral tissues, such as enamel and dentine. The bioceramics & piezoceramics market was dominated by the bio-inert ceramics segment in 2015. Increasing end-use applications, mainly dental implants and orthopedic implants, are projected to drive the demand for bio-inert ceramics between 2016 and 2021. Electronics ceramics & electrical ceramics are highly specialized materials which possess unique electric, magnetic, optical, mechanical, biological, and environmental properties. Alumina ceramics segment dominates the global electronics ceramics & electrical ceramics market, by material type. This segment is also projected to be the fastest-growing material type segment, in terms of both value and volume, during the forecast period. Ceramic coatings provide strength to materials, such as ceramics, metals, plastics, and so on by forming a distinct film on the materials to protect them from wear and corrosion. Oxide coatings and carbide coatings are the most widely used types of ceramic coatings. Transportation & automotive is the largest end-use industry segment of the ceramic coatings market. Technical ceramics are materials that have specialized and unique electric, magnetic, optical, mechanical, biological, and environmental properties. Non-oxides ceramics is projected to be the fastest-growing material type segment of the technical ceramics market, in terms of value, between 2016 and 2021. By end-use industry, the medical segment of the market is estimated to grow at the highest rate, in terms of value, during the forecast period. Ceramic fibers comprise an alumina-silica composition, held together by an inorganic binder. A ceramic fiber is commonly used as a refractory material. By type, the refractory ceramic fiber (RCF) segment dominated the ceramic fibers market, by value, in 2015, while the petrochemicals industry is its largest end-use industry. The top manufacturers catering to the top 10 high growth ceramics market include Morgan Advanced Materials, CeramTec GmbH, CoorsTek, Inc., Kyocera Corporation, and Rauschert Steinbach GmbH, among others. Morgan Advanced Materials: The Company’s long-term strategy is to focus on building its three distinctive core capabilities which are applications enginseering, materials science, and customer focus. The company is also planning to increase its R&D investments to strengthen its technical lead in the market and accelerate new product developments. CeramTec GmbH: It is one of the leading players in the technical ceramics and ceramic matrix composites market. It has developed silicon nitride and other ceramic composites for various high-temperature applications, such as space stations. The company has tapped the Asia-Pacific ceramic matrix composites market by expanding its production capabilities in China. CoorsTek, Inc.: It acquired Covalent Materials Corporation (Japan) to increase its presence in Asia. The company acquired various companies to expand its geographical reach. Kyocera Corporation: It is among the leading manufacturers of advanced ceramics and has maintained its position in the market by focusing on R&D to launch innovative and new products. The company is also focused on launching its products into new markets to help expand its geographical imprint and consumer base. Figure 11 SWOT Analysis: Coorstek Inc.